It is funny how the world turns. Once Hockenheim was the evil, drab place which killed Jim Clark and then as Formula 1 began to visit tracks of less and less character Hockenheim became charismatic. The Schumacher fans were part of the process for they added enthusiasm to a place where before Michael arrived everything was muted. And then, God forbid, we actually began to like the place and did not want it to see the old girl changed. Hockenheim was different to the other tracks. It was a place that harked back to the days when drivers were allowed to drive fast for sustained periods. It was dangerous (motor racing is dangerous) but it was also good to watch. Overtaking was never easy but it was possible. But this is romantic stuff. There were some harsh realities involved as well. Formula 1 wanted so much money that the numbers did not add up. The track capacity was such that there were not enough fans to pay the necessary bills. Added to which the size of the track meant that it was expensive to run. And so a plan was hatched to shorten the track and increase the numbers. Hermann Tilke, the Formula One company's preferred track designer these days, went away and took his blue pencil to the forest. More than 100 acres of trees became timber. The fast blasts through the cool forests were replaced by corners of a modern ilk. It became, in the words of Jacques Villeneuve, "just another circuit". Tilke, to give him his due, did a respectable job. He created a fast corner leading up to a hairpin and by doing so made overtaking all the more possible. He build tarmac run-off areas (the current vogue) so that drivers could push to the limit in the knowledge that if they make a mistake they can still drive around and rejoin the race. Mistakes did not punish them and so they were willing to take a risk or two. In a few years it is quite probable that Hockenheim will be a favorite again. The old circuit will have been forgotten. "Where was Jim Clark killed?" someone asked when we rode into the circuit one morning. "Up near the first chicane," came the reply. That said it all. Soon we will be explaining who Ayrton Senna used to be. In modern parlance, Michael Schumacher is a living legend. A cult figure, judging by the paraphernalia one can buy related to Michael. Hockenheim has often been the Temple at which the fans come to worship but, oddly, it is one of the tracks at which he has enjoyed the least success. He won here in 1995 and that was it. 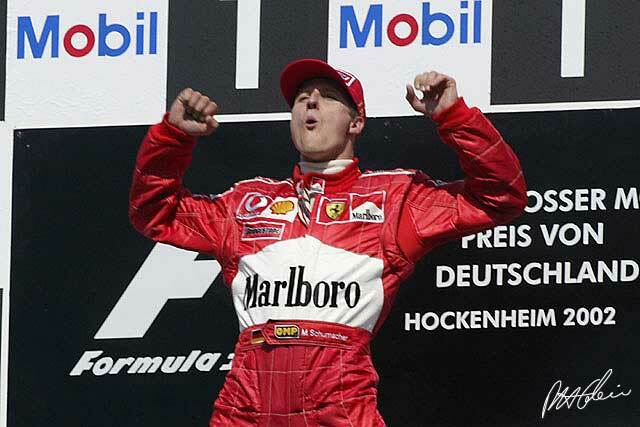 Now he is a five-time World Champion, he has few scores to settle but one of them was with Hockenheim. And in 2002 he wanted to balance the books. He was helped by the fact that the new Hockenheim played into the hands of the rounded F1 cars. In previous years this was the place for cars with good engines. The chassis was not such an issue but horsepower was essential. There was never a doubt in practice that Michael would be on pole. Rubens Barrichello was not in the picture. Juan-Pablo Montoya was not quite there and there was only Ralf to take on Michael. And the Williams was not good enough to beat the Ferrari. There was a kind of inevitability about Michael's pole position and in the fullness of time, after an interesting but not breathtaking qualifying session Michael was consecrated. It was his first pole for three months - and that was bad news because in recent races he has not needed pole to win. So no-one was holding out much hope for Sunday. Ralf was second and then behind him things were much as normal. There were Williams-BMWs, McLarens and so on. The Honda teams looked (finally) a little better than one would normally expect. The Renaults were there or thereabouts. Sauber was not as good as one might have expected. Formula Ford was more or less on a par with the Toyota Twins and Minardi (in the singular) was at the back. Alex Yoong never looked quick enough to make the cut. The midfield was very tight with 14 cars covered by a second. There seemed on Saturday night to be little chance of a race on Sunday. Michael would walk it. The midfield offered the hope that we might see some battling. A few brave souls, suggested that one day, Schumacher's reliability record (and luck) will come to an end. They were wrong. On Sunday it was Barrichello who got the bad luck at Ferrari (as usual). During the recognition laps Rubens discovered that the up-change on his car was not working properly. So the car was bundled off into the pitlane and Barrichello went for the T-car, which from now on will be set up for him at every race. He left the pitlane less than 10 seconds before it closed and so was able to take up his intended position on the grid. Given what has happened in recent races this was a step forward. At the start of the race Michael went off well and things were really rather orderly except from the two eccentric British drivers: Jenson Button and Eddie Irvine who used rather more track than they were supposed to. But as these days there are tarmac fields off line they did not lose much ground. Going down to the hairpin for the first time Raikkonen decided he was going to pass Montoya for fourth place and he did it. Behind him Coulthard was pulling a similar stunt on Fisichella and Panis who had qualified ahead. But he still had Jarno Trulli ahead of him and that meant that he was soon stuck in a traffic jam behind the blue and yellow beast that Jarno was trying to tame. Normally, Michael would have driven away from the field at this point but it was very hot and clearly the harder Michelin tires were not only working well, but were also working consistently. So a battle was on. After his initial burst Michael was only able to eke out a tenth or two each lap. And then Ralf began to chip away at the advantage. Later when it came to lapping people, Michael did his usual greased knife through Button while others stumbled through the small fry. Ralf lost three seconds stuck behind Trulli, who had dropped to the back of the field because of tire difficulties, and Jarno was later taken out and beaten up by the FIA Stewards, being sent to the back of the class with a drive-through penalty for blue flag blindness. Ralf was waiting for Michael to pit and then hoped to put the hammer down and do to his brother what his brother has so often done to others. Michael went into the pits on lap 27. Ralf let rip but when he came down the pitlane on lap 29 Ralf found Villeneuve trundling slowly in. It took Jacques just a couple of seconds to get out of the way but the damage was done. When Ralf rejoined Michael's lead was up to six seconds and the fat lady was doing voice exercises and getting ready to sing. Michael snuck gradually away from Little Bro and the second pit stops changed nothing. In the closing laps Ralf ran out of air in his pneumatic system and had to drop into the pits to have some more inserted. By the time he had rejoined, he had slipped back to third place behind Montoya. "These things happen," said Montoya, knowing well the concept. Barrichello should probably have been second but during the second stops the gremlins living inside his refuelling flap on his car refused to answer the door when the Ferrari men came to pump some gas into their home and it took 10 seconds of biting and scratching before the problem was solved. Rubens rejoined in fourth. Raikkonen's hopes of seeing off the Williams-BMWs looked strong for the early laps when he was ahead of Montoya but some lively motoring by the Colombian resulted in a couple of laps of exciting stuff and then Juan-Pablo got ahead and pulled away. Kimi took out his Game Boy, set the Cruise Control and seemed to be bound for fifth place when a rear right tire let go (probably as the result of wreckage) on lap 37. The Kimster was suitably chilled about this, flicked off the cruise control, adjusted his sunglasses and drove the three-wheeler round to the pits, bouncing over a sandtrap at one point to keep himself awake. The rear end of the car was damaged but the McLaren men stuck a new wheel on the car and off went Kimi again (albeit now at the back of the field) and was whizzing along down in Minardi-ville until he dropped the evil-handling wreck on lap 60. The final World Championship point went to Nick Heidfeld and that was thanks to Felipe Massa who pulled over and let Heidfeld pass him in the middle of the race when the Sauber team asked him "to do the right thing". It is not clear why this was necessary except that at the time Nick was going faster than Felipe. At the end of the race the opposite was true but Massa was not shown the green light to take back the place. It looks as though Massa may not be staying in Switzerland next year. He was less than happy afterwards. The rest of the survivors were few in number of little note. The Honda challengers went out one by one. Fisichella led the way initially but was bounced by Panis and Massa on lap 12. Panis then ran sixth until his engine threw in the towel on lap 40. Fisichella's dreams went wrong during his first pit stop when a front wheel got stuck on and a clutch problem added further time so he was back in 13th when he got going again. His race ended with an engine failure on lap 60. Villeneuve was 12th when he had a gearbox problem and went off. So that left Sato who came home behind the two Saubers. Not far behind him was Mika Salo who had never really been able to do much with his ill-handling Toyota. For the early part of the race Allan McNish outran him but Squish went out with an hydraulic problem early on. The rest failed to finish. Renault's decision to use soft Michelins was not a good one as Trulli and Button quickly faded back through the field, helped by the fact that both had string of other problems, linked to various gizmos which were not working as the boffins intended them to do. Both men went to the back of the class. Button retired gracefully with a mechanical problem while Trulli stuck his car off for no obvious reason. Jaguar Racing had another bad day. Pedro de la Rosa suffered a transmission problem of some sort and went out on the first lap. Irvine suffered problems with his traction-control, which caused him several spins, before retiring with brake troubles on lap 57. Arrows had a worse day. Frentzen's car did not leave the grid. It took three laps to get the car started and it lasted only 21 laps before retiring with an hydraulic failure. Bernoldi went out with an engine failure having spent the day in the midfield. Mark Webber was also left on the grid in his singleton Minardi because of an electronic problem. He got the car going and quickly caught the pack and began to pass the backmarkers but eventually he went out with a hydraulic failure when he was in 14th place. The fans were happy. Michael Schumacher was happy. It had been a nice win but nothing sensational.